Armed – Ready For Battle. Vince D’Acchioli speaking to Canyon Ridge Christian Church in Las Vegas, NV. This message contains the powerful testimony of what God taught Vince in the midst of the battle for his wife Cindy’s life. Purchase Men On Target Small Group Curriculum – Volume 1 DVD. Want to start a small group? Get prepared, take the OTI Leadership Facilitation Training for new or seasoned small group leaders, get the twelve 12-minute part study DVD. 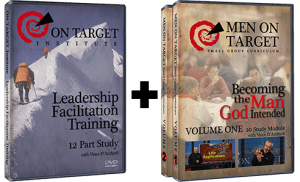 Get The OTI Leadership Facilitation DVD + the Men On Target Curriculum – Volume 1&2 DVDs Combo Set for big savings.